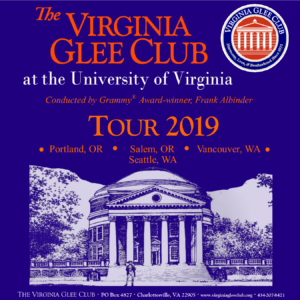 The Glee Club hits the road again for a spring break tour on March 9, 2019! This year, we’ll visit the Northwestern states of our great nation, with stops in Seattle, Portland, Salem, and more. We always look forward to seeing our friends and fossils when we travel. Please come see us! Concert details below! Tickets are available here. Event details are here. Visit our donations page to learn about supporting the Glee Club's mission. The Virginia Glee Club is an affiliated group of the McIntire Department of Music at the University of Virginia. Although this organization has members who are University of Virginia students and may have University employees associated or engaged in its activities and affairs, the organization is not a part of or an agency of the University. It is a separate and independent organization which is responsible for and manages its own activities and affairs. The University does not direct, supervise or control the organization and is not responsible for the organization’s contracts, acts or omissions.